Please see our termly curriculum letter for more information. We have all had a lovely time as we have settled into Year Four. We have been reading Grendel and the Cautionary Tale of Chocolate, which has been teaching us a valuable lesson. So far we have studied the story line in-depth and thought of our own three wishes. We have also been learning how to use our senses to describe a setting for our story. We have learnt about story structures and have used this to create our own book. In our science topic this term, 'It's Electric', we will be experimenting with designing and testing how circuits work. Our trip to the Science Museum is looming and we are eagerly waiting to see the energy galleries to help us with our learning! The first half of the spring term has been very interesting. Our class novel, ’Noah Barleywater Runs Away’, has us all on the edge of our seats, as we are yet to find out why Noah has left home. 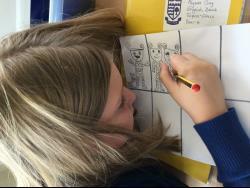 The pupils have been focussing on story structure and have done a great deal of work based on characterisation and setting. In addition, as part of our topic,’ Antarctic Adventures’, we were also able to do landscape paintings using watercolour. 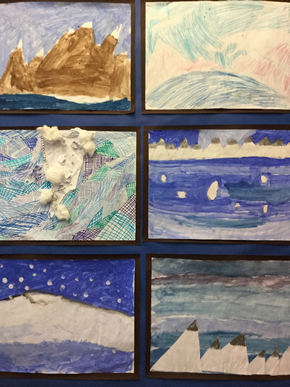 The finished paintings were stunning and were used to create an Antarctic display. 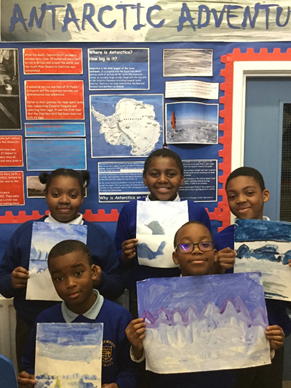 To further enhance the children’s historical knowledge about the Antarctic they were able to research information about Robert Falcon Scott and completed biographies about him. This term we are focusing on learning about the Romans based on the topic,’ Roman Invasion’. 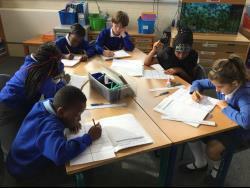 In literacy the pupils will learn about features of a newspaper article and will write their own about the Roman lifestyle and culture. They will also learn about Roman society through their core text, ’The Captive Celt’ by Terry Deary’s Roman Tales. The pupils will also learn about mosaics in their art unit of work and create mosaic patterns of their own. We will celebrate the term’s work by having a Roman Day where the children will participate in a variety of activities that existed during Roman times.